Please Look After This Bear : Mr. and Mrs. Brown first meet Paddington on a railway platform while waiting for their daughter Judy. He is sitting on an old leather suitcase near the lost property office, wearing an unusual hat and a label round his neck which reads `Please Look After This Bear. Thank You'. He explains that he has been sent from Peru by his Aunt Lucy who has had to go into the Home for Retired Bears in Lima. After a sticky adventure with some cream buns in the station buffet, they take him in a taxi to stay with them in their home at Number 32 Windsor Gardens. A Bear in Hot Water : Paddington meets Judy's brother Jonathan and Mrs. Bird, the Browns' housekeeper, who decides Paddington is badly in need of a bath. The only problem is that he has never experienced taps or plugs before and Jonathan and Judy soon need to go to his rescue when water starts dripping through the sitting room ceiling. A Disappearing Trick : It is Paddington's first birthday since going to live with the Browns. He marks the occasion by putting on a magic show with his new conjuring outfit much to the enjoyment of everyone except the Browns' grumpy next door neighbour, Mr. Curry, who wasn't even invited in the first place! The final straw comes for Mr. Curry when Paddington borrows his watch to demonstrate a trick; unluckily for Mr. Curry and the watch, Paddington turns over two pages of his instruction manual at once. ... and Paddington and the Amateur Dramatics. Michael Bond was born in Newbury, Berkshire, England on 13th January 1926. He was educated at Presentation College, Reading. During World War II Michael Bond served in both the Royal Air Force and the Middlesex Regiment of the British Army. He began writing in 1945 and sold his first short story to a magazine called London Opinion. This experience helped him decide that he wanted to be a writer. 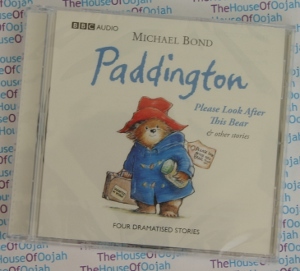 Michael Bond never thought of writing for children but, after producing a number of short stories and radio plays, his agent suggested that he adapt a television play for children. His first book, A Bear Called Paddington, was published in 1958 by William Collins & Sons (now HarperCollins Publishers). At the time, Michael Bond was working as a television cameraman for the BBC. After the first Paddington book was accepted, Michael Bond went on to write a whole series and by 1965 his books were so successful that that he was able to give up his job with the BBC in order to become a full-time writer. In 1997 Michael Bond was awarded an OBE for services to children’s literature. He is married with two adult children and lives in London, not far from Paddington Station.